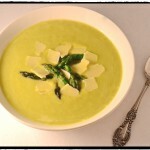 Cream of Asparagus Soup - What the "Forks" for Dinner? 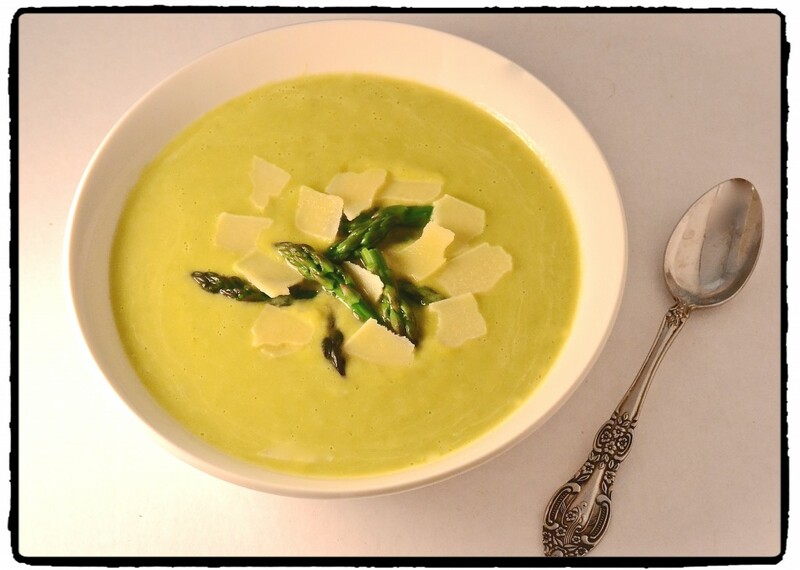 Cream of Asparagus Soup……….even the name sounds silky and elegant. That is just what this soup is, and it has no cream in it………What you say no cream????? I know I was amazed too! I have made plenty of cream soup, but they have all got their creaminess from heavy cream. But heavy cream has a lot of calories, and a lot of fat so, what to do to reduce that?? I have seen recipes what have used instant potatoes to thicken soups, so I wondered if a regular potato would work. Low and behold it did! Adding some onion and garlic to the asparagus gave it just the right underlying taste. The only other thing it needed was salt and pepper. Now, I have have one of those handy immersion blenders, and next to my Kitchen Aide stand mixer, it is one of the best gadgets I own. It works like a blender but with NO, I repeat, No big mess to cleanup after, just plug it in, stick it in your pan, and blend away. There are many versions on the market, do yourself a favor and get one…….. you won’t be sorry. Now, I did want to add just a touch of cream with out using cream, so sour cream (low-fat) is a great substitute. You just need a small amount to make a big impact. 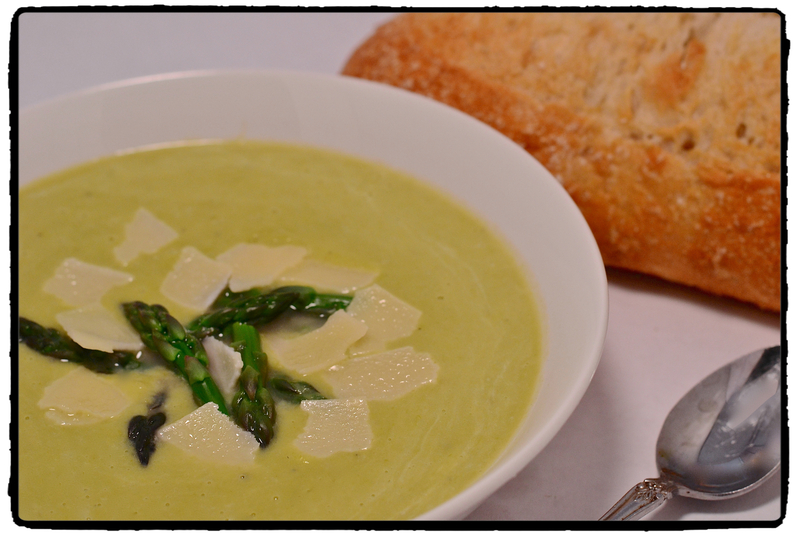 I garnished the soup with some beautiful reserved asparagus tips that I blanched until just tender crisp, and just a few slivers of parmesan cheese. Serve it with a rustic loaf of French bread, and it’s a great light lunch or dinner. 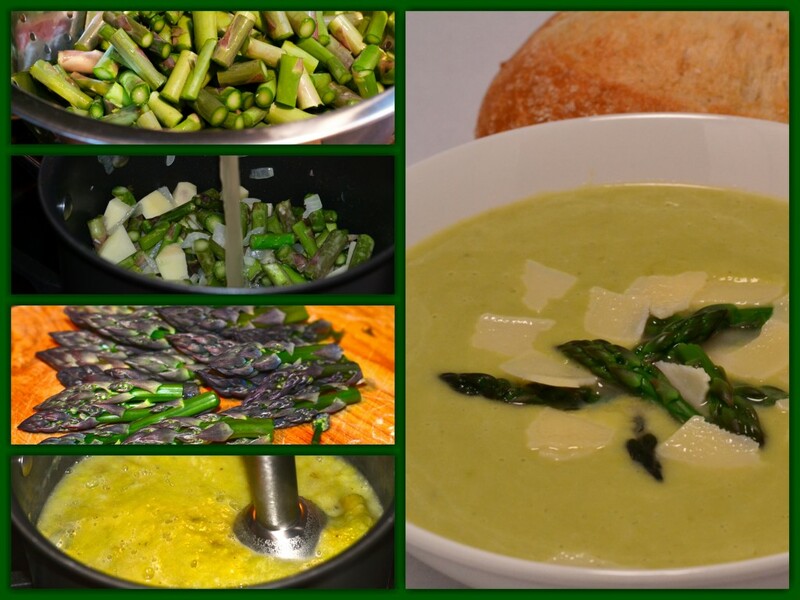 Of course, as always if you have your own asparagus …………….Yum! I am still gushing over ours, it is fabulous! Cream Soup with out the cream! In a large pot, melt butter over low heat. Add onion and garlic, sauté on low for 3-4 minutes. Add diced potato and asparagus pieces to onion and garlic in the pot. Add chicken stock and season with salt and pepper. Cover and cook for 20-25 minutes or until asparagus is very tender. While asparagus is cooking, blanch tips until tender crisp, cool under running water and set aside for garnish. Remove from heat and using an immersion blender puree until smooth (alternately you can puree mixture in a regular blender in batches, then return to pot). Stir in sour cream until well blended. Ladle into serving bowls, garnishing with asparagus tips and parmesan cheese.